Bullying can often be dismissed as teasing. Some people use the two terms interchangeably, but teasing and bullying are not the same kinds of actions. This distinction is due to how teasing affects people differently than how bullying affects others. Researchers have been continually finding disturbing links between suicidal ideation and bullying. The researchers also noted higher rates of depression, violent behavior, and substance abuse in bullying victims. Bullying victims who have been invalidated with these kinds of statements, and the inaction of those who should be caring for them, are far more likely to experience the serious side effects of bullying that researchers have indicated. The intention behind the action is what separates teasing actions from bullying behaviors. If the purpose was to hurt the other person and does not be stopped when requested, then the action was bullying. Friendly or neutral intended actions can be classified as teasing and the person teasing will cease when asked to stop. However, this simple definition can only take you and your child so far in recognizing the difference between the two types of interactions, since the intention of the other person may be unclear. When there is an established friendship or close relationship, bullying is not usually the goal. In these instances, it is far more likely when the teasing comes to close to bullying, the teaser will stop when asked since the intention was good-natured. Teasing is appropriate when everyone receives a fair share of the teasing. If one or two people are singled out for extra teasing, then it can become bullying. Those who are teasing should not repeatedly tease about the same thing, as it can easily turn into harassment and bullying. As teasing can also turn into negative, bullying behavior, parents may need to intervene. 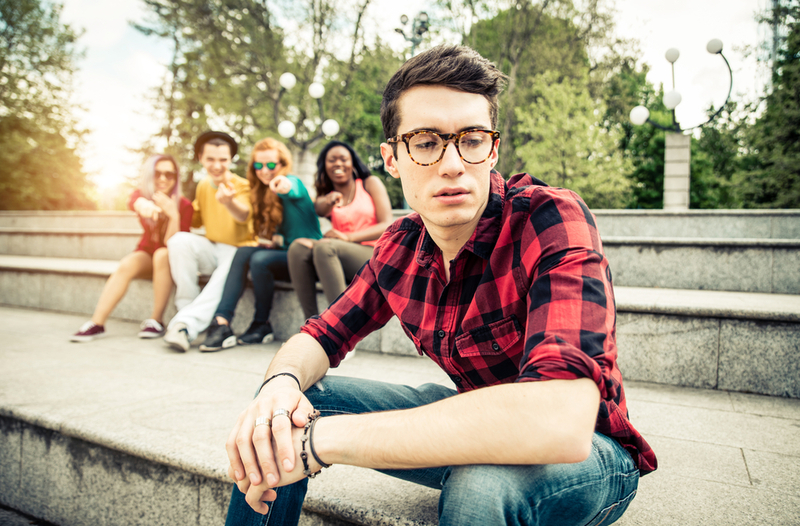 If your teen falls in with a bad crowd and starts exhibiting harmful coping methods due to bullying or engages in bullying behaviors, it may take serious intervention to help them repair their behavior. Bullying behaviors can be easier to identify once you and your child know what to look for in the other person’s actions. While there are many avenues for bullying, from face-to-face bullying to cyberbullying, there are three distinct characteristics which define bullying behavior. 1. A power imbalance is created – A bully creates a power imbalance by making their target feel unsafe and insecure around them. This imbalance places the bullying in a more powerful psychological position which can be very damaging to the bully’s victim, mentally and sometimes physically. 2. A pattern of negative behavior is followed – A one-off negative interaction does not generally constitute bullying. What sets a bully apart is a pattern of targeting someone with intentionally hurtful words and/or actions. 3. The bully’s target is negatively impacted – The most straightforward bullying characteristic is simply identifying if the actions were hurtful or not. Whether adults consider it hurtful is not important; the impact on the child is what defines the negative impact. Once you or your child recognize someone’s behavior characteristics as bullying toward your child, it is essential to take action. While some schools in the United States have started enacting stricter rules against bullying, it is still a prevalent issue today. It is likely that your child will encounter a bully a few times during their time in school; Because, according to the National Center for Education Statistics, over one in five children have reported that they have been bullied. Since it is clear that bullying is still a significant issue for many adolescents, it is important for both parents and children to have a clear plan of action when bullying occurs. Depending on whether your child is the target of the bullying or sees someone targeted by a bully, there are various things which your child can do. Tell a trusted adult – Unfortunately, not all adults take bullying as seriously as they should. Make sure your child knows who to talk to if they are bullied or observe someone being bullied. Don’t play into bullying antics – Many bullies feed off of the attention they gain from others with their bullying behavior. Your child should refrain from laughing at a bully’s mean-spirited jokes, so the bully has less encouragement to continue. Support the bullying target – If your child feels confident enough, they should openly support the bullying target. Many times, a bully will pick on someone who they feel is isolated with no one to stand up for them. If your child is not in a position to openly support someone, then see if they can privately offer the bully’s target support. Address the bully – While asking the bully to stop their bullying actions may not work, if it is simply teasing which has gone too far, asking the bully to stop can bring around positive results. Stopping a bully often requires adult intervention. Parents who intervene are generally more effective than adults with a weaker relationship with the victim and bully. Work with school administration – As school is often the source of bullying, meeting with school administrators, teachers, and the school counselor is key to create an effective plan to stop the bullying. Contact the bully’s parents – Most parents of bullying children don’t want to believe that their child would bully anyone. If you contact the parents of the bully, avoid accusations and harsh language as you discuss the bullying problem. Give your child resources and support – More than anything, it is vital that you support your child if they are being bullied. Be sure to educate yourself with stop bullying resources so you can know what exactly you can do for your child. Parents play the most important role when it comes to ending bullying. Not only should your child know the signs of bullying to recognize them in others, but also to prevent them from becoming bullies. The sooner bullying is identified, and intervention strategies are applied, the better the chances of a good outcome for you and your child. Be sure to remain actively engaged in your child’s life and help them identify the differences between teasing and bullying so your child will feel comfortable coming to you for help with bullying.